Want to liven up your daily servings of vegetables? Consider adding kelp to your diet. It's a vegetable of the sea that’s chock-full of nutrition and low in fat and calories. A staple in many Asian countries, kelp is a natural source of important vitamins and minerals and offers antioxidant properties to possibly prevent disease. Kelp, also known as ascophyllum nodosum, is among the largest varieties of cold-water species of seaweed. It grows underwater in shallow, nutrient-rich coastal saltwater beds around the world. Some species of kelp grow over a foot a day and can reach heights of 250 feet. Kelp has long, tough stalks, and its edible part includes broad, brown, leaf-like fronds divided into strips. If you're watching your weight, the good news is that kelp won't contribute much to your daily caloric intake. It has only 43 calories per 100 grams, which is a little less than 4-ounces dried. With 2 percent daily value for carbohydrates, kelp contains 9.6 grams per 100-gram serving. Kelp contributes 5 percent DV of fiber to help your digestive system. Per 100 grams, it supplies 1.7 grams of protein, or 3 percent of DV, according to the USDA National Nutrient Database. The total fat content of kelp is only .6 grams per 100-gram serving. Kelp doesn't contain cholesterol and has only .2 grams of saturated fat. If you're on a low-fat diet to treat a medical condition, kelp may be a welcome addition to your menu. Because it absorbs the nutrients from its surrounding saltwater marine environment, kelp is rich in minerals. It contains 168 milligrams of calcium, which is more than many vegetables, including collard greens and kale, according to UCSF Medical Center. Your body needs calcium to maintain strong bones and muscle function. Kelp excels in its magnesium content with 121 milligrams or 30 percent DV per 100-gram serving. Magnesium is important for synthesizing protein, maintaining muscle and nerve function and regulating blood pressure. A good source of iron to maintain healthy blood cells, kelp has 2.8 milligrams, or 16 percent DV, per 100 grams. It rounds out its abundant mineral content with manganese, potassium and zinc to help combat oxidative stress and benefit the health of your heart. Kelp is an excellent source of vitamin K and supplies 82 percent of your daily value in just 100 grams. Vitamin K is required for proper blood clotting and bone metabolism in your body. Be aware that if you're taking blood thinners such as warfarin, consuming too much vitamin K can have negative side effects, and you may want to first talk to your doctor before adding kelp to your diet. Folate is an important nutrient for pregnant women to help prevent birth defects, and by supplying 180 micrograms, or 45 percent DV, kelp is a good source. In addition, kelp contains the B vitamins riboflavin, pantothenic acid and thiamine required for proper metabolism and energy production. Kelp contains vitamin C (3 milligrams or 5 percent DV) and vitamin E (.9 milligrams or 4 percent DV per 100 grams) that provides antioxidant benefits for your health. Seaweed contains a number of potentially bioactive compounds which are not present in terrestrial plants and may have anti-obesity benefits. Researchers have indicated these components may help to prevent weight gain or promote weight loss. A 2014 study discovered that a natural fiber derived from kelp, called alginate, could help block fat absorption in the intestines by 75 percent. The results, published in Food Chemistry, discussed the potential of alginate as a viable dietary fiber for the treatment of obesity. Kelp contains antioxidants, including carotenoids, flavonoids and alkaloids, which may help reduce disease-causing free radicals that cause cancer and other serious disease. 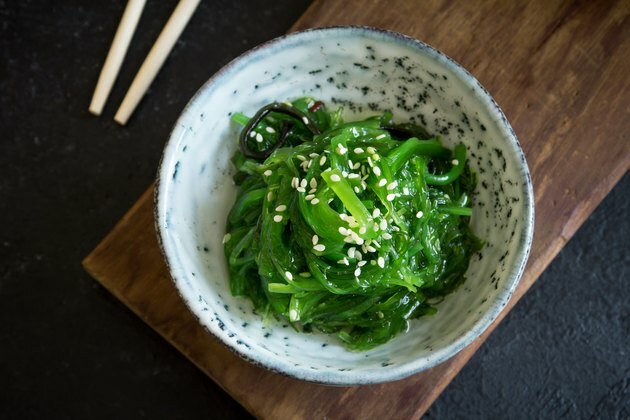 Researchers have deduced that the consumption of seaweed may be a contributing factor in the low incidence of cancer in Japan and in other countries where marine organisms are traditionally consumed. Several compounds extracted from brown seaweed may have biological anticancer properties. A 2014 study focused on using these compounds to test their effect on slowing the progression of cancer, particularly colorectal and breast cancers. The conclusion, published in the journal Marine Drugs, was that various therapeutic components in kelp were successful in inhibiting the growth of cancer cells, and the study emphasized the importance of seaweed in the fight against certain cancers. The recommended average daily amount of iodine needed by adults is 150 micrograms. Pregnant or breastfeeding women need 50 percent more. Sufficient iodine levels are necessary for ideal thyroid hormone production. In turn, low iodine levels can lead to hypothyroidism, causing symptoms of fatigue, depression, weight gain and inability to tolerate cold, according to Mayo Clinic. A moderate iodine deficiency can also cause low IQ in infants and children and impaired cognitive ability in adults. The danger of inadequate iodine for pregnant women is permanent harm to the fetus, including stunted growth and mental retardation. Severe iodine deficiency can result in an enlarged thyroid gland, known as goiter, warns NIH. To help prevent the problem of deficiency, iodine is commonly added to table salt. However, if you're on a low-sodium diet or eat specialty salts that don't contain iodine, kelp is one of the best natural food sources of iodine, containing levels typically around 700 micrograms per gram, according to Nutra Ingredients-USA. Although kelp has many health benefits, its high iodine content can make consuming too much dangerous. Consult with your doctor before taking kelp supplements if you have a thyroid disorder, an allergy to iodine, kidney or liver disease. Although the upper limit for iodine is 1,100 micrograms, the FDA set the safety standard for iodine content in a kelp supplement to not more than 225 micrograms per daily serving. Eating kelp as food is safe, but excessive iodine intake from kelp in ascophyllum nodosum supplements can overstimulate your thyroid and cause inflammation of the thyroid gland and increase your risk of thyroid cancer. A very large dose of iodine can create nausea, fever, weak pulse or a burning sensation in the throat, mouth and stomach. Although kelp is available in supplement form, it’s always best to get your nutrients from whole food. Kelp can be found in Japanese or Korean restaurants and in many specialty grocery stores. It’s easy to incorporate kelp in your diet along with plenty of vegetables from both the land and sea. You can add organic dried kelp to soups or use raw kelp strips in salads and main dishes. Use dried kelp flakes as seasoning. Kelp can be eaten hot in soup or stew, cold with oil and sesame seeds, or even blended into a smoothie or vegetable juice. Does Kelp Help With Hair Growth?